Who doesn’t like Henry the vacuum cleaner? You can’t help but fall in love with the cheeky smile and sparkling eyes of the only cleaning aid with a friendly face! And so it was with my little boy. He had only to clasp eyes on Henry before he was taken with the smiley face. Only this time, instead of the real, functional Henry, we were looking at a miniature replica. I am talking about the Casdon Henry Cleaning Trolley. 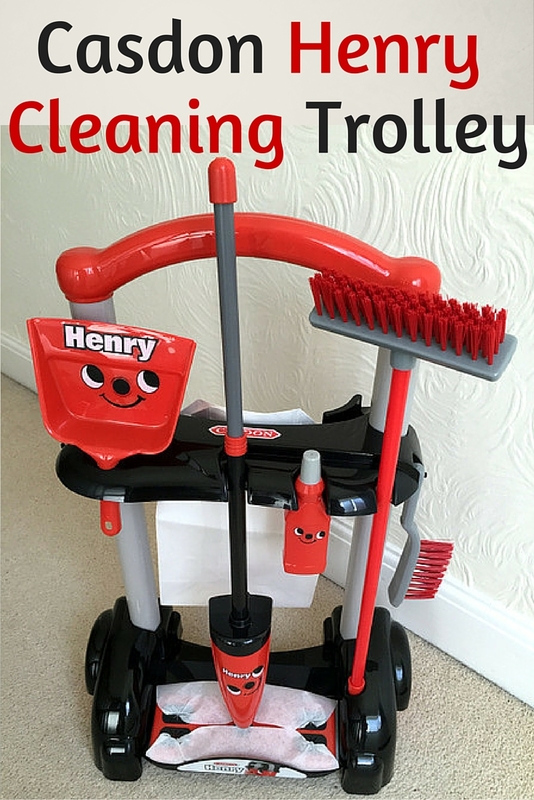 It comes in the red and black colours of the original Henry and includes a very realistic Henry spray mop complete with a bottle of liquid dispenser and a cloth. Also included are a long-handled broom, brush, dustpan and waste bag. All of these sit smartly on a trolley with wheels that can be pushed along from one room to the next as you go about your chores. J was delighted to finally have his own Henry to help him help his Mum with all her cleaning tasks. Not before Mum had sorted through the various pieces in the Casdon box and assembled the cleaning trolley in its entirety. It was easy enough to do. The only part I struggled with a little was trying to get the spherical head of the mop to fit in its socket. I had to put a bit of muscle into it, that’s all. The Henry Cleaning Trolley was assembled and fully functional in all of 10 minutes. We put the stickers on to give Henry his smiling face. Then J was off, trialling first the broom, then the dustpan and then the mop. He first swept the floor, carefully gathering all the dust and depositing it into the dust bag. He then set about mopping everything to make it sparkle. I am amazed at how much J loves his new Casdon toy. He has played with it every day since he got it, without being prompted to do so. So much, that I have had to intervene to stop his obsessive cleaning. He has cleaned the whole house from top to bottom more times this week than Mum manages in a month! I am really pleased at the way the trolley looks and functions. It is very realistic and the mop head swivels backwards and forwards, much like the real thing. The trolley does tend to topple over if both the mop and the broom are taken off simultaneously. So you have to remember to replace one back in its slot before you pull out the other. Or prop it against the wall for support. The mop-cloth and dust bag will need replacing over time, but nothing a routine microfibre washcloth and paper bag can’t fix. Overall, I think the Henry Cleaning Trolley is perfect for pretend play, especially for when your little ones insist on helping out with household chores. I’d so rather have my son potter about with his toy trolley than monopolise my vacuum and mop. And Henry's smiley face is perfect to brighten up even dreary cleaning days. Disclosure: We were sent a Casdon Henry Cleaning Trolley for the purpose of this review. All opinions are my own. This looks so much fun - I wish it had been available when my son was younger. This looks so much fun! This would get Max into the swing of helping me tidy up! Mine are a bit old for this now but they would have LOVED it! I once saw this product in a shop and thought it was a cleaning trolley for adults, then I realised it was a kids toy! Hey, if it works, we can let the kids clean up a bit! What a great toy - I wish that my kids would get involved with cleaning! We have a Henry and I think my 4 year old would love having his own version! What fun! I have to say that even though my two have their own cleaning things, they still want mine, though!